Zacks Investment Research reports Dillard's Inc. (NYSE:DDS) has gained significant momentum following its fiscal third-quarter results on November 8, which included an earnings surprise of 28%. Shares of this fashion, cosmetics and home furnishings retailer hit a 52-week high of $86.71 on the day of the announcement, and have now amassed a year-to-date return of 87.6%. Earnings estimates for fiscal 2012 and 2013 have been trending upward over the past week, helping DDS achieve a Zacks #1 Rank (Strong Buy) on November 13. Dillard's reported fiscal third-quarter earnings of 96 cents per share last week, surpassing the Zacks Consensus Estimate of 75 cents and doubling last year's earnings of 48 cents. This marked the ninth straight quarter with a positive earnings surprise. The performance was aided by healthy sales performances, gross margin improvement and prudent cost control measures. Net sales (including CDI Contractors LLC or CDI) increased 4.8% year over year to $1,449.6 million from $1,382.6 million. Merchandise sales, excluding CDI, came in at $1,425 million, compared with $1,366 million. The company's total revenue (including other income) of $1,486.3 million climbed 4.8%. Comparable store sales (comps) were up 5%. The Zacks Consensus Estimate for the quarter was $1,450 million. Men's apparel and accessories were the outperforming categories, followed by women's accessories, lingerie and shoes. The category that witnessed the lowest sales was home and furniture. Dillard's gross margin from retail operations (excluding CDI) expanded 40 basis points (bps) to 37.1%, while consolidated gross margin (including CDI) rose 30 bps to 36.6%. The Zacks Consensus Estimate for fiscal 2012 jumped 4.6% to $6.33 per share in the last 7 days, reflecting year-over-year growth of 50.4%. For fiscal 2013, the Zacks Consensus Estimate climbed 9.9% to $7.20 per share over the same time frame, representing a year-over-year increase of 13.7%. Barring a few occasional pull backs, shares of Dillard's have been trending upward since the beginning of the year, and are now hovering close to its 52-week high, reflecting bullish growth momentum for the rest of 2012. 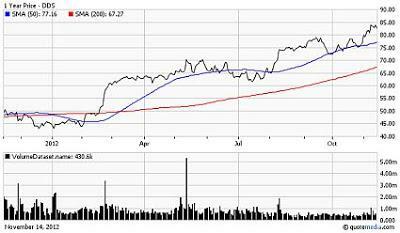 The stock has been consistently trading above its 200-day moving average since February 17, 2012. It has also remained above the 50-day moving average since October 31, 2012. Volume is fairly strong, averaging roughly 443K daily. The year-to-date return for the stock is 87.6% compared with the S&P 500's return of 6.1%. 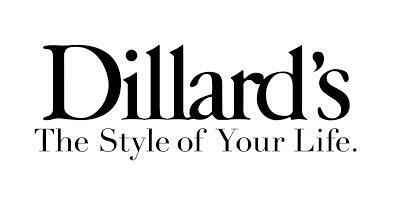 Founded in 1938 and headquartered in Little Rock, Arkansas, Dillard's is a large department store chain, featuring fashion apparel and home furnishings. The company's primary product categories are: women's and junior's apparel; shoes; accessories and lingerie; men's clothing and accessories; cosmetics; home; and children's clothing. Its merchandise mix consists of both branded and private-label items. As of October 27, the company operates 284 outlets and 18 clearance centers and one Internet store across 29 states. Dillard's, which primarily competes with Kohl's Corp. (NYSE:KSS) and Macy's, Inc. (NYSE:M), has a market cap of $3.89 billion. Disclosure: I have no positions in any stocks mentioned, but may initiate a long position in DDS over the next 72 hours.